BRISTOL - The Bristol Eastern girls tennis team took down Bristol Central, 6-1, on Friday evening. After Bristol Central’s Abby Gorneault defeated Kelly Simpson (7-6, 6-3) to open the match, the Lancers rattled off six straight victories to close it out. 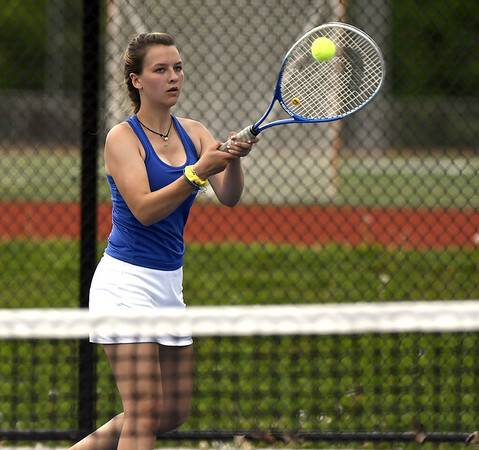 Danielle Barrington, Sara Stadnicki, and Ashlee Lewandoski each won singles matches. Val Blanchard and Leah Mastroianni, Megan Yates and Laney Kosakowski and Lauren Murphy and Hannah Chadeayne won doubles matches for the Lancers (1-3). Bristol Eastern 2, Maloney 0: Mike Giovinazzo is inching closer and closer to career win No. 600 as the Bristol Eastern baseball team’s head coach, and he has his red-hot Lancers to thank for that. On Friday evening, Bristol Eastern kept up its unbeaten start to the season as starter Trevor Mays was lights out, pitching a complete game, allowing three hits with seven strikeouts and two walks in a 2-0 win over Maloney. Mays (1-0) received all the way run support he needed in the second inning. James Dauphinee doubled to left-center to open the frame, and Andrew Lozier later roped a two-RBI single for the Lancers (4-0). Dauphinee finished with two doubles, and Anthony Marrotti tallied a triple. St. Paul 7, Oxford 1: Julian Thayer, Shaun Remillard and Dylan Gagnon combined to throw a three-hitter to lead the Falcons (4-1) to the win over Oxford (4-2). Thayer earned the win, throwing five innings and allowing one unearned run on two hits with eight strikeouts and three walks. Ethan Rembish (2-for-3, double, RBI, run) led the way for St. Paul, which also got a double, RBI and run scored from Thayer and Ryan Daniels. Walker Sharp finished 2-for-3 with an RBI and run scored. Terryville 2, Gilbert 1 (9 innings): For the second straight night, the Kangaroos (3-2) won a thriller, defeating Gilbert (1-5) on a throwing error with two outs in the ninth to plate the winning run. Nick Ieronimo started, pitching five innings and allowing one earned run on six hits with eight strikeouts, and Colby Rheault earned the win in four innings of work with two hits allowed and six strikeouts. Colin Bamrick smacked a pair of hits and scored a run, and Anthony Pires roped a double. St. Paul 6, Oxford 2: The Falcons (4-1) plated two runs in the first inning and second inning and roped 12 hits to help give winning pitcher Abby Poirot (2-1) enough run support. SINGLES: 1. Abby Gorneault (BC) def. Kelly Simpson (BE), 2-0; 2. Danielle Barrington (BE) def. Emilie Dube (BC), 2-0; 3. Sara Stadnicki (BE) def. Melaney Dam (BC), 2-0; 4. Ashlee Lewandoski (BE) def. Abby Denoncourt (BC), 2-0. DOUBLES: 1. Val Blanchard and Leah Mastroianni (BE) def. Michelle Helming and Danielle Carey (BC), 2-0; 2. Megan Yates and Laney Kosakowski (BE) def. Erica O’Connor and Kristina Pasqua (BC), 2-0; 3. Lauren Murphy and Hannah Chadeayne (BE) def. Ava McCann and Sam Chapman (BC), 2-0. Posted in The Bristol Press, Bristol Central, Bristol Eastern, St. Paul, Terryville on Friday, 12 April 2019 21:17. Updated: Friday, 12 April 2019 21:20.